Vaccinated populations contract some of the highest rates of disease and more evidence on whooping cough is coming forward to support this claim. Whooping cough, or pertussis, is spreading across the entire US at rates at least twice as high as those recorded in 2011 and epidemiologists and health officials are even admitting that the vaccines may be the cause. Officials at the U.S. Centers for Disease Control and Prevention (CDC) say the best way to prevent pertussis is to get vaccinated. Yet data from the Vermont Department of Health (DOH) suggests that going through the pertussis vaccination regimen is not fixing the problem or warding off the highly contagious disease. If anything, it appears to be making it worse. The United States is on track for more cases of whooping cough this year than in any other year since 1959. Children receive the last dose of the vaccine, known as DTaP between ages 4 and 6. They get a booster shot in adolescence. But the problem with the DTaP vaccine according to a recent study in the New England Journal of Medicine, is that the vaccine is not effective after a certain period of time, and many are now speculating that its effectiveness is nil from the very first injection in the series. The study compared 277 children, ages 4 to 12, and found that a child’s odds of contracting pertussis increased 42 percent every year after the fifth dose. The new study joins several others in the last few years in suggesting that children ages 7 to 10 have less immune protection against whooping cough. But this the first study to estimate how much the vaccine's effectiveness declines after the multiple doses, the researchers said. The cause could very well be due to multiple loads of toxins delivered through the DTaP vaccine which include, (but not limited to): formaldehyde, aluminum hydroxide, aluminum phosphate, thimerosal, and polysorbate 80. That means that every DTaP vaccine contains carcinogenic, neurotoxic, immunotoxic and sterility agents just like many of this year's flu vaccines. These chemicals then bioaccumulate in the child with each successive vaccine, further introducing an additional load of toxins with each injection. Patsy Kelso, a DOH epidemiologist, said the vaccination regimen isn’t producing the desired results. And it’s not just Vermont; every state but Michigan and California have experienced outbreak levels at least twice as high as those recorded by the CDC at this time in 2011. 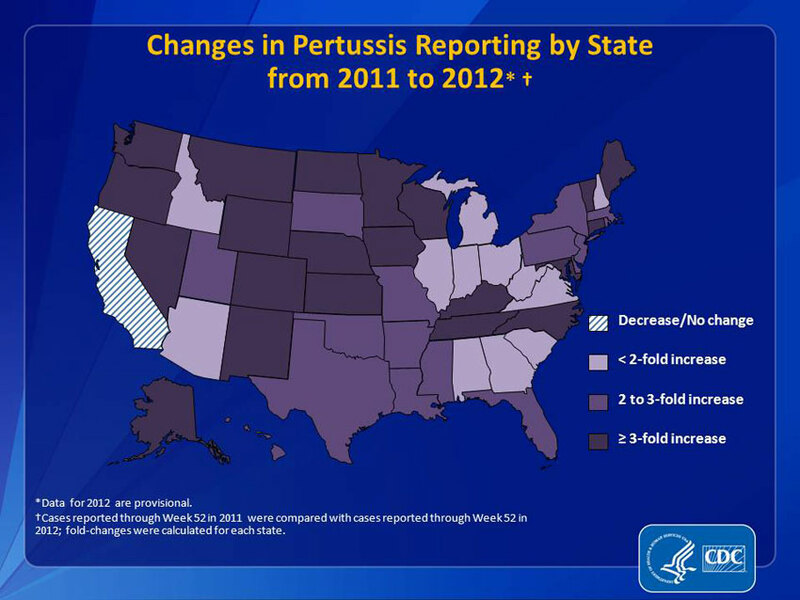 As of the 39th week of 2011, the CDC had recorded 11,969 pertussis cases. That number has nearly tripled this year, as officials have documented 30,908 cases. Health officials should make sure that they are not "creating new pockets of disease in other age groups," said study researcher Lara Misegades, of the Centers for Disease Control and Prevention. The CDC's Advisory Committee on Immunization Practices (ACIP) has not discussed changes to the whooping cough vaccine schedule for children. And it will likely be some time before the committee votes on the issue, said ACIP member Dr. Mark Sawyer, a professor of pediatrics at the University of California, San Diego. ACIP was the same agency who in 2010 called for a super stimulation of the human immune system through a universal flu vaccination. In 2012, there have thus far been more cases of pertussis than in any full calendar year recorded since 1959, when roughly 40,000 cases were reported. The last time Vermont saw pertussis cases near this year’s level was in 1997 when 283 were reported. In 1996, 280 cases were reported. As of Sept. 20 of this year, Vermont had the sixth highest incidence rate in the country, with 42 people per 100,000 contracting pertussis. Wisconsin had the highest incidence rate in the country at 78.6, then Minnesota with 63.5 and Washington with 58.1. The national average is 9.3 people per 100,000. Kelso said that the current thinking among health officials is that this widespread uptick in pertussis is due to the vaccinations. Listed below are links to blogs that reference this entry: Recent Evidence Shows Vaccinated Kids Account For 90 Percent of Cases of Whooping Cough. This page contains a single entry by Toni published on November 30, 2012 3:56 PM. The Myth of a GMO-Free European Union was the previous entry in this blog. Is Michelle Obama's "natural food" campaign a covert op? is the next entry in this blog.